After a month on the water (and a few weeks getting my land legs again), I’m happily settling back in at home. 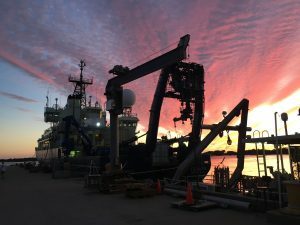 I just returned from an expedition to a site known as North Pond along the western flank of the Mid-Atlantic Ridge aboard the research vessel (R/V) Atlantis, operated by Woods Hole Oceanographic Institute (WHOI). The cruise was fantastic and I had the chance to chat with different research groups about their projects centered on understanding the ecology of microbial communities in the deep sea. Over the course of my next set of posts, I will discuss some of the cool research led by the scientists I had the chance to work with on the cruise. 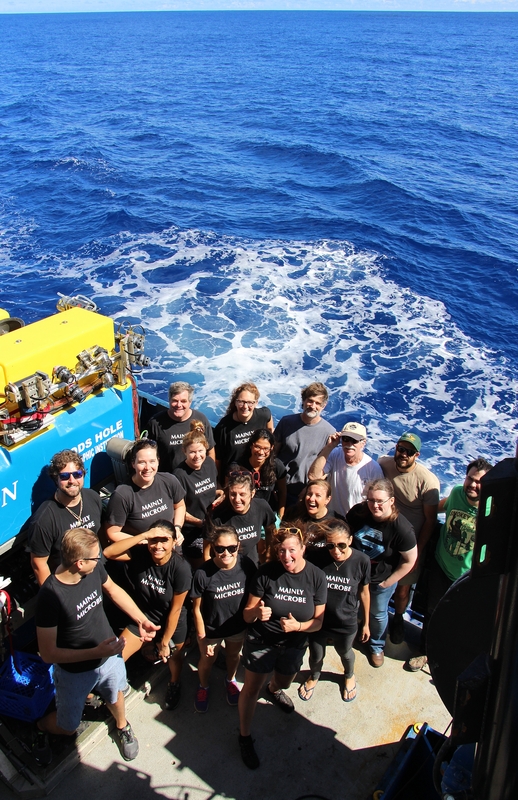 The expedition focused on understanding processes and microbial communities under the seafloor. One way to study this ecosystem involves collecting water samples (crustal fluid) from under the oceanic crust at unique platforms referred to as Circulation Obviation Retrofit Kits (CORKs) that have been installed on the seafloor. The basaltic aquifers that we collected fluid from are the largest on the planet, and studying what biogeochemical processes are doing down there helps us better understand cycles globally. 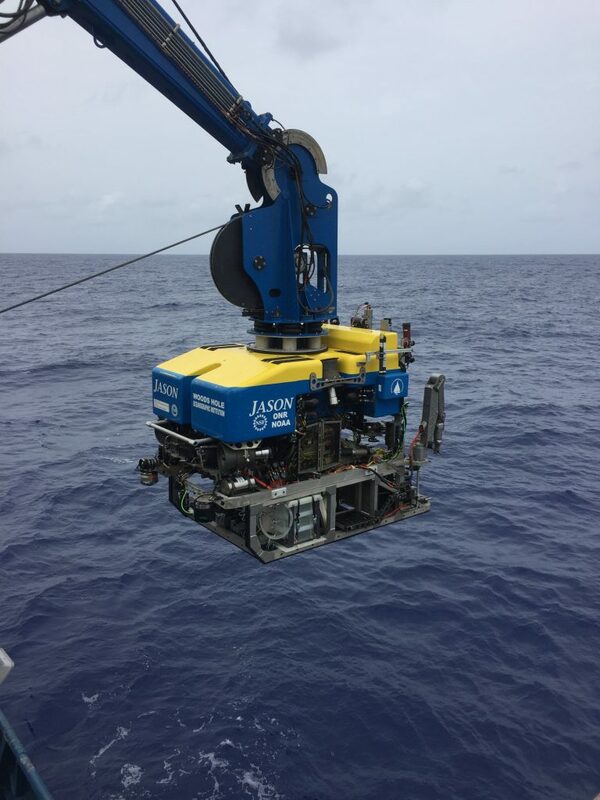 We brought along with us specially designed sampling equipment to be loaded onto the remotely operated vehicle (ROV) Jason..(Jason II to be exact). The equipment included a set of bags held in plastic boxes that are all plumbed to be filled from a hose connected directly to a valve on the CORK. In addition to one large sample bag on the “front porch” of the ROV (on the front side), we had 6 smaller bags on the back as well as some filters we passed water through while the ROV sat patiently 4,500 meters under the ship (which, turns out, is approximately 0.8 leagues under the sea….how disappointing). We collected the precious crustal fluid on 5 different Jason dives, which might not sound like a lot, until you realize that it took about 2.5 hours for the ROV to descend 4,500 meters, and then, among various additional tasks on each dive, filling the bags and managing the filters lasted ~ 8 hours each time. In the end, we collected a total of about 600 liters of subsurface crustal fluid, equal to over 1,200 pints, I guess the round was on us. In addition to sampling fluid, other dives were made to collect sediment from the sea floor and experiments that had been incubating in the CORK itself, as well as accomplish other tasks. In future posts, I’ll discuss some of the incubation experiments where small chips of different minerals were placed in the CORK to allow for colonization of microbes in situ. While I’ve been lucky to have my fair share of field work, this was my first research cruise. The whole adventure was pretty darn awesome and I’m stoked I was able to be a part of it. I’m looking forward to discussing some of the projects from this expedition more in depth (ha), and hopefully you’re on board for it too. This entry was posted in fieldwork, just for fun, microbiology and tagged C-DEBI, deep sea benthos, North Pond, R/V Atlantis, ROV Jason, WHOI. Bookmark the permalink.